Starting next year, private insurers that provide coverage to about 20 million seniors through Medicare Advantage will get new powers to bargain over drugs administered in doctor’s offices or hospitals, Xsaid Aug. 7 in an interview with Bloomberg. The treatments subject to the change include infusions for rheumatoid arthritis, eye injections to treat certain conditions that cause vision loss as well as some cancer therapies. The government and consumers in the plans spent $25.7 billion on Part B drugs in 2015. The change will bring what Medicare pays closer in line to what the private sector gets. In the commercial market, health insurers negotiate discounts of 15 percent to 20 percent or more on the same drugs for which Part B has paid full price. Half of the savings will be required to go back to patients. In future years, the savings will be used to reduce premiums. But because 2019 rates are already set, patients may receive a gift card instead. Azar said the real benefit will begin to be seen in 2020 once insurers have had more time to implement the new protocol. Their experience could serve as “a roadmap as we work with Congress for future change.” Medicare would need congressional approval to implement negotiation on Part B drugs more broadly. As a negotiating tool, health insurers will get the ability to make patients try cheaper products first, a technique called step therapy, before turning to more expensive drugs. That can create leverage for insurers to push for rebates and discounts in exchange for not pushing patients into step therapy, which can steer them to cheaper, rival treatments. The change applies only to new prescriptions, not to people already on a drug, and patients asked to use the step-therapy process would be able to ask for an exception. They would also be able to switch into a different health plan through March 31. Medicare already runs prescription-drug benefits for most drugs through private health insurers through what’s known as the Part D program. Implemented in 2006, it relies on insurers and pharmacy-benefit managers to negotiate discounts. 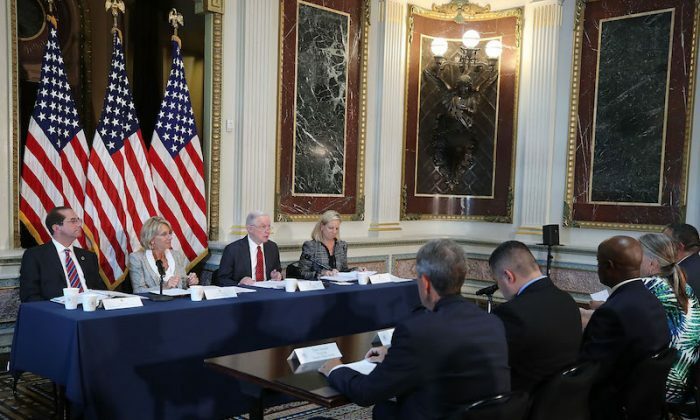 The new program announced Aug. 7 would harmonize Part B and Part D payments for many drugs, especially in cases where one drug for a disease might fall under Part D, and another under Part B. “The typical example here would be rheumatoid arthritis,” Azar said. Rheumatoid arthritis injections Humira and Enbrel from AbbVie Inc. and Amgen Inc. respectively, are covered under Part D, while Remicade from Johnson & Johnson, an infused therapy for the same disease, is covered under Part B. “Now, the Medicare Advantage plan could decide if it wanted to manage that holistically as a class and help direct their patients to the most cost-effective treatments and the most appropriate sequencing of medicines,” Azar said. Other prominent products paid for by Part B include Merck & Co.’s lung cancer drug Keytruda; Opdivo from Bristol-Myers Squibb Co., also for lung cancer; and Amgen Inc.’s Neupogen, meant to boost white blood cells after cancer treatment. The administration has made several significant moves over the past month to implement Trump’s drug-pricing blueprint, including submitting for White House Office of Management and Budget review a proposal to curb exemptions from kickback laws when drugmakers negotiate rebates with insurers and pharmacy-benefit managers. Curbing rebates is seemingly at odds with the administration’s push on Aug. 7 to expand them through price negotiation. Azar emphasized that plans can currently negotiate discounts to bring down list prices and don’t solely rely on rebates.